Jon K. Gelhaus, Ph.D., John Morse, Ph.D. and C. Riley Nelson, Ph.D. The current project of the Mongolian Aquatic Insect Survey is an inventory of the freshwater insects of the waterways of the Altai Mountains and southern Hangai Mountains in western Mongolia. This project builds on earlier aquatic surveys in the Lake Hovsgol Basin (1995-2002) , and the Selenge River Basin (2002-2007), both in northcentral Mongolia. This project involves a comprehensive, three-year sampling program for a range of aquatic macroinvertebrates, to assess habitats, and measure physical parameters, mostly through month-long expedition sampling. The expeditions are collaborative with an international group of American, European and Mongolian scientists and students. Goals for this project include surveying the major groups of aquatic insects and other invertebrate groups, collaborative publication of the survey results, and development of associated databases. The proposed survey will allow these U.S. scientists to develop meaningful collaborations with current Mongolian scientists and to train Mongolian students in the field and laboratory. Studies of aquatic insect taxonomy and distribution provide important results for understanding the evolution, biogeography, and ecology of aquatic communities in Asia. Increasing economic development and population in Mongolia are stressing the aquatic biological communities through mining, untreated wastes, agriculture, over-grazing, and fires, along with effects from worldwide climate change. Broad sampling of aquatic invertebrates during this survey along with the collection of water quality and riparian zone (streamside) measurements is generating not only basic scientific knowledge of the biological diversity of the region, but also providing the Mongolian government a yardstick for monitoring water quality. The scientific knowledge is useful in guiding Mongolia’s government in its attempts to protect the environment and to develop eco-tourism. 1. Sample intensively the Mongolian aquatic invertebrates, particularly insects, at more than 150 sites with a wide variety of aquatic habitats in the Mongolian Altai, Turgen, and southern Hangai Mountains drainage basins (western and southern Mongolia) to allow future determination of the aquatic biota’s phylogenetic and biogeographic relationships among these western basins, with the Selenge Basin, Gobi region, Hovsgol and Baikal Lakes and with the surrounding Central Asian, Oriental and Eastern Palearctic regions. Collection of associated data at each site including geographic coordinates (GIS), water chemistry, habitat characterization, and level of human and domestic animal impact will be used by our postdoctoral scientist in developing tolerance limits for aquatic monitoring. 2. Establish sampling programs to gather long-term seasonal collections from selected sites in the Selenge Basin, using cooperative agreements among projects to complement our four years of sampling spread over 200 sites. 3. Improve knowledge of Mongolian aquatic insect species. We predict that the number of Mongolian species in selected groups will eventually increase by 86% (567 species). 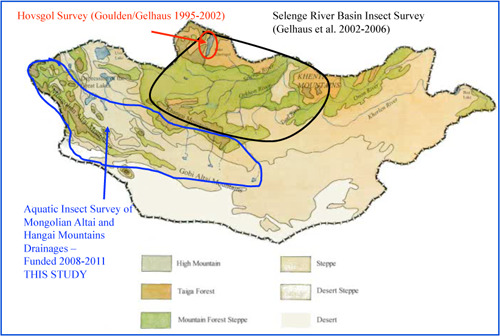 Based on the Selenge survey and this biotic survey, we will test these hypotheses: (1) Species turnover will be at levels seen in Selenge Basin or higher, due to high diversity and endorheic basins, (2) at least 20% of these species will be endemic to Mongolia and Central Asia, and (3) biogeographic relationships of these species will be to Himalayan and Tien Shan mountain regions and/or western Palearctic (the latter indicated by disjunct populations of species in the Selenge Basin otherwise known only from the West Palearctic). We expect less than 5% of these species will be distributed also in the adjacent Oriental Region due to Gobi Desert and Altai Mountain barriers. 4.-7. Identify caddisflies (Trichoptera), stoneflies (Plecoptera), and mayflies (Ephemeroptera) and aquatic flies (Diptera), particularly crane flies (Diptera: Tipuloidea), to species level, with description of new species and electronic publication of collection data. 8. Deliver Odonata (dragonflies), aquatic Coleoptera (beetles), Megaloptera (alderflies), other Diptera (true flies), Mollusca (clams, snails), and other invertebrates to specialists for study and identification with electronic publication of species lists and dissemination of collection data. In addition, terrestrial insect groups will also be collected in sweeping and trapping, and will be made available for study, including Hymenoptera (sawflies, wasps, bees), Hemiptera (true bugs), Orthoptera (grasshoppers), Coleoptera (beetles), and other groups. 9. Continue training 9 students to conduct field surveying and identification of taxa with intensive training of 4 at the graduate level in systematics and ecology of Trichoptera (Clemson University, CU), Plecoptera (Brigham Young University, BYU), Tipuloidea (NUM), and Ephemeroptera (Czech Republic). Training opportunities for many other students will include team taught workshops at the NUM and Mongolian State University of Education, in field and lab research in Mongolia, and through graduate training in the United States, like the team-teaching accomplished by us in Mongolia with earlier grants. 10. Continue development of collection expertise, resources and deposition of representative, authoritatively determined voucher collection in a Mongolian Academy of Sciences depository, including type material. 11. Continue production of a database of collections, including specimen, locality, and associated data, and a bibliography of relevant literature, available over the Internet. The database will also allow users to assess the amount of material remaining unstudied. Awarded to J. Gelhaus, J. Morse, C. R. Nelson. This project is an inventory of the freshwater insects of the waterways of the central and eastern Altai Mountains and southern Hangai Mountains in western Mongolia. These mountains include the highest peaks in Mongolia, up to 4374 m. The eastern streams of the Mongolian Altai drain into closed basins, the Uvs Nuur Basin UNESCO World Heritage Site and a series of freshwater and saltwater lakes just south of Uvs Nuur Basin that also receive flow from the southern side of the Hangai Mountains. The region is well-known for harboring several species of globally endangered mammals and endemic fish; we expect to discover there many similarly isolated indigenous species of aquatic insects. In freshwater aquatic habitats, insects comprise a large portion of organismal diversity. Studies of their taxonomy and distribution provide important results for understanding evolution, biogeography, and ecology of aquatic communities. Increasing economic development and population in these western mountains are stressing the aquatic biota through mining, untreated wastes, agriculture, over-grazing, fires, and climate change. The project will generate not only basic scientific knowledge of the biodiversity of the Altai and Hangai drainages, but also provide the Mongolian government a yardstick for monitoring water quality. This project is a comprehensive, three-year sampling program for a range of aquatic macroinvertebrates, to assess habitats, and measure physical parameters. The principal investigators are established insect systematists with a broad range of field experiences around the world, including major inventory projects at Lake Hovsgol and the rest of the Selenge River drainage, Mongolia. Our expeditions are collaborative with Mongolian scientists and students, and non-Mongolian scientists, building on relationships that were developed during the previous inventories.. Goals for this project include surveying the major groups of aquatic insects and other invertebrate groups, collaborative publication of the survey results, and development of associated databases for aquatic macroinvertebrate literature, specimen-based distribution records (both survey and literature-based), locality and habitat classification, and specimen images. Databases will be assembled by Mongolian and American scientists and will be available over the Internet. Over 80 scientists specializing in over 60 groups of organisms have agreed to study the resulting samples. In addition, we will train staff of the Mongolian Institute for Meteorology and Hydrology to continue sampling aquatic insects at their stations all over the Selenge Basin, adding data from throughout the sampling season. The major sampling activity for 2008 was a survey of the Northern Altai Mountain drainages, mostly in Altai Tavan Bogd national Park. The expedition included 13 scientists (US, European and Mongolian) and 8 support staff (manager, drivers, cooks). The group sampled qualitatively at 50 sites, including 5 rivers, 39 streams, 5 lakes and 1 spring. In addition 34 of the streams were sampled using Rapid Bioassessment protocols, including semiquantative and qualitative benthic samples. All of these RBP sites included samples of water chemistry and habitat assessment. Trapping methods for inventory included use of Townes-style malaise traps, use of aerial nets to sweep vegetation, and inspection of riparian and benthic rocks and other debris. Generally, riparian vegetation was considerably less than in the Selenge River Basin, resulting in a noticeably lower diversity of adult aquatic insects. In 2008 the laboratory at The Academy of Natural Sciences focused on sorting samples, primarily the backlog from the Selenge Basin sampling. This effort was enhanced through funding for sorters from the President Fund grant from The Academy of Natural Sciences and work-study students from Temple University and University of Pennsylvania. Backlog has been sorted to Order, which for most groups is sufficient for sending to collaborating specialists. In some groups sorting is proceeding to the Family level (e.g. Diptera, Hymenoptera, Hemiptera). In 2008, the laboratory in Mongolia was staffed in Fall 2007 and spring 2008 through the President Fund grant through The Academy of Natural Sciences. Oyunchuluun Yadamsuren was hired to manage the lab. Two new employees were hired for the Hydrobiological Laboratory of IMH (sharing the same space, and using equipment provided by our project) and received training from the manager and during the expedition. Focus was on sorting backlog samples in Mongolia, particularly the four years of Malaise trap samples received from the Hovsgol GEF project (which had ended). A statistical short course was also organized for the laboratory staff. The laboratory staff also facilitated the planning and preparation for the expedition, and arranged the sampling and export permits. This project is coordinating with Asia Foundation and the PIRE project to share a 20 ft shipping container to send equipment and supplies for all three projects in Mongolia. Shipping will take place in late February 2009. Two staff members from the Hovd IMH office and 2 from the Olgiy IMH office were shown in the field how to sample freshwater macroinvertebrates, how to measure habitat parameters, and how to record these data. Staff members were interviewed and their immediate needs assessed, identifying a lack of benthic nets, pans, and other routine field equipment. Each staff member was given a pair of high-quality field forceps. o	How to collect and sample aquatic insects. o	Preserving & labeling sampled specimens. o	Advantages/disadvantages of using aquatic insects for monitoring water quality. o	Freshwater habitats and communities; river continuum concept; nutrient spiralling. o	Insect morphology and special adaptations for aquatic life. o	Orders of aquatic insects. o	Family-level classification, biology, and literature of freshwater Ephemeroptera, Odonata, Plecoptera, Hemiptera-Heteroptera, Megaloptera, Trichoptera, Coleoptera, and Diptera. Our project and Asia Foundation are planning in April 2009 a joint training session for the water quality samplers found throughout Mongolia and employed by IMH. These samplers will gather in Ulaanbaatar in April for a training conference, where they will be taught better sampling methodology, sample handling and transport, and constructing, maintaining and using sampling equipment. Ms. Suvdtsetseg Chuluunbat was a MS degree student during the first year of our grant under John Morse. In this period, she assisted in preparing for and executing the 2008 expedition with particular attention to the caddisflies and managing the resulting specimens. She oversaw the preservation and initiated identification of the caddisflies. Ms. Chuluunbat graduated from Clemson University with her MS degree on 18 December 2008. She has returned to Mongolia and has been hired recently back on the MAIS project. Sarah is a Masters Student working on the Plecoptera (stonefly) samples, as well as helping with implementing our specimens database in FileMaker Pro. Sarah Judson accumulated stonefly identification literature for Mongolia and used it to identify all the stoneflies collected by C. R. Nelson in the expeditions to the Selenge River drainage basin in 2005 and 2006. She has examined a total of 834 specimens in 31 species from 2005; 1341 specimens in 24 species for 2006. With only half of the 2008 samples sorted she has identified 1108 specimens in 22 species. In addition she identified all specimens of Plecoptera collected during past Mongolian expeditions associated with the Academy of Natural Sciences of Philadelphia ranging from 2000 - 2006. She has recently begun examination of a large lot of stonefly specimens housed at the IMH in Mongolia that Jon Gelhaus had shipped to the United States. She will use this opportunity to compare her past identifications with those made by Sanaa Enkhtaivan and seek congruence and accuracy. We are accumulating numerous specimens of stoneflies and entering their collection information into the developing database. Brigham Young University. BYU Laboratory. Wertz was upported on funding through BYU to participate in the fieldwork in Mongolia in July 2008.. Joss Wertz traveled with the 2008 expedition and managed yellow pan traps at most of the sampling sites visited. He ran at least 20 yellow pans at each of these sites and used a standardized sweeping routine so that the two collecting methods can be compared for efficacy. Upon returning to BYU he has managed the training of other undergraduate students under the supervision of Riley Nelson. He has tutored the sorters in fly identification and has sorted and identified Diptera from many of the pans to family. McKnight sorted 2008 expedition samples to Order and extracted aquatic forms and robber flies (Diptera: Asilidae). He helped with curation and museum labeling of specimens. He is also exploring the robber fly taxonomic literature for Mongolia. He is particularly useful in this effort because of his fluency in Russian. The work of Russian expert Dr. Pavel Lehr in Russia, Kazakhstan and other parts of central Asia is the key to an understanding of the Mongolian fauna. He is funded from BYU Mentoring Environment Grants (MEG) to Riley Nelson to further the study of alpha taxonomy of Asilidae. Buckner is a mentored volunteer in the Nelson Laboratory developing a biomonitoring project comparing the use of adult versus nymphal stoneflies in community assessments. To this point he has been sorted 2008 hand collected samples to Order and is extracting aquatic forms. He has also submitted a BYU ORCA proposal to fund this work in the future. He helps with curation and museum labeling of Mongolian specimens. Shurtz is fluent in Mongolian and tutored Riley Nelson once a week during both Winter and Fall semesters of 2008 with plans to continue in 2009. She did this as a volunteer and teaching assistant. This tutoring has proven valuable in interpreting label and map information as well as in building good relations with Mongolian researchers and support staff. Frandsen is sorting and identifying Diptera from yellow pan traps to the family level. In October he submitted a proposal to the BYU Office of Research and Creative Activity (ORCA) for funding to study in greater depth the dance flies (Diptera: Empididae) of Mongolia. Martin sorted 2008 hand caught samples to Order and extracted aquatic forms and other key target taxa to make them available to taxonomic experts. He also is the main person creating the museum labels dealing with localities. Temple University Student – Neurophysiology/Psychology Major. Supported on Work-study funds (no cost to NSF Project) and Hourly funds (from Project budget). Funk has worked on Mongolian insects for 2 years. She is competent in identifying insects to order, and within Diptera and Hymenoptera, she has been trained to identify many insects to family level. Because of exposure to Academy’s REU program in summer 2008, she is applying for Neurophysiology REU programs for summer 2009. Temple University Student – Environmental Studies Major. Philadelphia Laboratory. Supported on Work-study funds (no cost to NSF Project). Kuang is competent in identifying insects to order. Applied to Pharmacy School. Interested in Forensic Science and Law. Philadelphia Laboratory . Supported on Work-study funds (no cost to NSF Project). Wall is competent in identifying insects to order, and worked over summer 2008 at a forensics lab using training received in MAIS laboratory. Institute of Meteorology and Hydrology (IMH) – A new MOU was drafted in November 2008, after meeting with Director Azzaya in April and Nov 2008. IMH provides laboratory and collection space for our project, and we work closely with their biomonitoring staff. IMH staff also help with obtaining sampling and export permits. In our previous project (Selenge Basin) we provided cabinets for the collection , field opportunities and training for staff. We will continue these efforts. Staff from the Entomology department have been invaluable in planning the expeditions and some logisitics. National University of Mongolia (NUM) – Ecology Department (Dr. Boldgiv Batsuren); Dr. Soninkhishig Nergui Biology Faculty,Chair of Water Research Center. Our project works closely with two faculty at National University and several graduate and undergraduate researchers. Our project provides field and lab opportunities for NUM students. Our project has shared cost in providing researcher Soninkhishig with a research quality compound scope to continue her work on diatoms. She mentors a student Ms. Uuganaatsetseg who has iodentified and analyzed a number of diatom samples from our Selenge Basin work. Our project also will be providing some cabinets and literature for use by NUM Biology and Ecology faculty and students. This project is funded to develop citizen environment monitoring groups, encourage citizen knowledge and participation, and to coordinate government agencies concerning clean water issues. Our project has worked closely with Asia Foundation in presenting a training workshop on aquatic insect ecology and identification, and planning training, sampling and coordination of data. University of Pennsylvania. We are cooperating at present with this project on sharing expenses (also with Asia Foundation) on a shipping container for shipping equipment and supplies from the US to Mongolia. Twelve papers were published or submitted. Eighteen presentations were made by project staff and collaborators. Primary activities for Gelhaus included administration of the entire project, including planning of the sampling in Mongolia, and specific administration of the Mongolian and Philadelphia identification laboratories. Gelhaus travelled to Mongolia in April 2008 to attend a conference on ecology and as an invited speaker. While there, he reviewed the lab, and met with the director of IMH to discuss the new project. He also met with collaborators at National University, and researchers at Mongolian Academy of Sciences and the Natural History Museum. Gelhaus returned to Mongolia in November 2008 to meet with laboratory personnel, work with Oyunchuluun on two crane fly papers, finalize the MOU with IMH, and met with collaborators at NUM and MAS. Besides participation in the 2008 fieldwork, Morse’s primary activities included preparation of photographs and locality labels for the 2008 collections, helping to prepare and submit for publication a manuscript on world Manophylax species, editing the MS thesis for Suvdtsetseg Chuluunbat, and otherwise assisting her to finish her MS degree at Clemson University. John Morse taught an intensive, all-day course entitled "Aquatic Insects of Mongolia Useful for Monitoring Water Quality" at National University of Mongolia (NUM), Ulaanbaatar, every day during 22-30 June 2008. Primary activities included participation in the 2008 fieldwork and administration of the BYU identification laboratory. Riley handled the administration of the fieldwork while in Mongolia. Upon the return from 2008 fieldwork, Riley Nelson reviewed the locations sampled during the 2008 expedition and compared it to the field records assembled by the other participants. From this he created a standardized list of locations and attached them to the IPTC caption fields of the over 4,500 photographs he took in 2008. Riley Nelson worked with graduate student Sarah Judson to develop the prospectus for her Master's thesis at Brigham Young University. Riley Nelson worked with Sarah Judson to develop a work plan for the identification and databasing of Mongolian stonefly specimens. Judson has written the database structure using FileMaker Pro version 9. This Plecoptera database is serving as a test of the database structure for the entire project, with other tests being conducted in Philadelphia laboratory for other insect groups. Riley Nelson talked with Dr. Wayne Mathis of the Smithsonian Institution in his BYU laboratory. Wayne is excited of the prospects to study the shore flies, Ephydridae, from the Mongolia Aquatic Insect Survey. The yellow pan traps that Joss Wertz and others are sorting contain large numbers of shore fly specimens, as do the associated sweep samples. Riley Nelson and Elizabeth Bankhead at BYU have made frequent contacts with Dr. Brad Sinclair of Canada concerning dance fly projects, including those in both the United States and Mongolia. Dr. Sinclair is helping with identifications and is suggesting Old World experts to work with the Mongolian material. In 2008, Hayford examined 1416 chironomid pupal exuviae from aquatic habitat in Gorkhi Terelj National Park and two stream sites outside of the park. The subfamily Podonominae was identified for the first time from Mongolia, which resulted in a publication in the Journal of the Kansas Entomological Society on the first record of Podonominae and the Podonominae species, Trichotanypus posticalis and Paraboreochlus minutissimus, in Mongolia. All told the 98 species or species groups identified resulted in 36 new species records for the country. Diversity of the chironomid pupal exuviae from Gorkhi Terelj formed the basis of a diversity and ecological analysis, which was written up as a manuscript and submitted for publication. In 2008, Hayford worked on checklist and databases during summer of 2008. She created and hosts the on-line checklist of Mongolian Chironomidae at: http://academic.wsc.edu/faculty/bahayfo1/MonChiro.html, which can also be found through a link on the Chironomidae Home Page checklists and catalogs page: http://insects.ummz.lsa.umich.edu/~ethanbr/chiro/checklists.html. Hayford also entered the 2008 Mongolian field data into the MAIS project database. Hayford has performed ecological analysis of stream sites from the Selenge River watershed based on water quality and family level insect identifications. She is preparing a manuscript for circulation to her colleagues who work on the MAIS project. Will Bouchard was hired in June 2008 as the Postdoctoral Scientist to focus on the qualitative and semi-quantitative aquatic biomonitoring data. He supervised the biomonitoring, chemistry and habitat assessment sampling and qualitative benthic sampling in Mongolia during July 2008. Will took another position with the State Of Minnesota in September 2008, but remains a collaborator with the project, working on a manual to identify benthic invertebrates of Mongolia to family, and with Barbara Hayford on Chironomidae. Short has worked with our Mongolian projects since a graduate student. He chairs our efforts on sampling and identification of the Coleoptera (beetles), coordinating specimen preparation and moving specific groups of beetles to collaborators for identification to species. Kula has taken on the role of coordinating the identification of the Hymenoptera samples ( wasps, ants, sawflies). He presented a workshop in Hymenoptera identification for the staff and volunteers at Academy of Natural Sciences in July 2008. Oyunchuluun has worked with us since 2002. She is manager of the Mongolian laboratory. Her specialty group is the Tipuloidea (crane flies). She has two applications out for graduate schools in the USA. Bolortsetseg primary role in this project is to participate in the biomonitoring sampling, particularly for benthic insects. She is developing her speciality in identification with the Ephemeroptera (mayflies). She also developed expertise in sampling and identifying Rotifera in a previous NSF project. Sosoburam’s primary role in this project is to participate in the biomonitoring sampling, particularly for benthic insects. She is developing her specialty in identification with the Odonata (dragonflies and damselflies). Enkhnasan’s role is to sample and identify the aquatic beetles. She has entered the PhD program at NUM in Fall 2008 and will do a thesis on aquatic beetle ecology. Uuganatsetseg is completing her Masters at NUM on diatom ecology based on samples from the Selenge Project. She carried out diatom sampling on the expedition in 2008. Through her experience, she was hired as diatom taxonomist for the government’s geology program. Dr. Jäch has completed a manuscript on the Hydaenidae of Mongolia, a group of aquatic beetles, based on our Mongolian samples. Out of 16 spp recorded, two are new country records, and one is a new species. This work was done in conjunction with collaborator Andrew Short. Dr. Jäch had also previously trained our researcher Enkhnasan when she visited Vienna a few years ago. Dr. Zwick identified our material of two families of flies, the Blephariceridae (new winged midges) and the Ptychopteridae (phantom crane flies). Four species of blephs and one of Ptychoptera were recorded. Dr. Shaverdo worked with Mongolian researcher Enkhnasan, training her and collaborating on a paper treating the Dytiscidae of Mongolia. This paper is based on the material collected in Mongolia by "Selenge River Expedition, 2003-2006". It reports 87 species of Mongolian Dytiscidae, including literature data, and 20 species and one subspecies are recorded from Mongolia for the first time. Lead researcher on Sciomyzidae (snail killing flies). Manuscript prepared with Jon Gelhaus. Has found several new species and numerous new country records. We have cooperated with the Ichthyology Department and advised them on their own expedition to Mongolia in 2006, and sent along one of our researchers to work with them. Mark identifies the fish specimens that end up in our samples. Several papers and websites appeared in 2008 resulting from this work. Suvdtsetseg carried out a protocol where she removed a leg from each of several specimens of essentially all Mongolian caddisfly species captured by the MAIS and forwarded for DNA barcoding to this project to be analyzed by Dr Xin. Voucher specimens from which these legs were taken have been identified and deposited in the Clemson University Arthropod Collection (CUAC). Brad is the expert and coordinator for the large fly group Empididae. He was able to provide a generic list form our material early in 2008, and has incorporated the species of Iteaphila macquarti in an ongoing revision and can report that the species of Anthepiscopus is new and very closely related to a Rocky Mountain species. Both genera are being revised at present and a Holarctic revision of Iteaphila will be completed this year. Dr. Rueda has identified our mosquito adults, and will continue to help us sample better and identify this important group. He provided in Oct 2008 a first set of identifications, showing 4 genera and 6 species. Dr. Rozkosny has identified our Stratiomyidae (soldier flies) and has prepared a manuscript with Gelhaus. The Mongolian fauna includes now 43 species, with one new country record from the project samples.